WELLESLEY, Mass. – Poet and literary critic Dan Chiasson has just been given a chance to be even more poetic. An assistant professor of English at Wellesley College, he has been awarded a 2008 Guggenheim Fellowship for poetry. The honor will grant the gift of time and leisure, two things long deemed essential to a writer’s life. I wish I were as big as a basketball hoop. It is actually painful to be this fine. will invent a game to make you hard to hit. Thanks to the Guggenheim Foundation, he will divide his time next year between two great passions: writing and teaching. 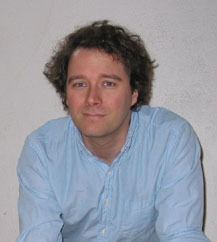 Chiasson, named “Debut Poet” by The New Yorker in 2001, received his Ph.D. in English from Harvard in 2002 and has published two books of poetry: The Afterlife of Objects(University of Chicago, 2002) and Natural History(Alfred A. Knopf, 2005). A third, Where's the Moon, There's the Moon, will be published by Knopf in the fall of 2009. He is also the author of a critical book on American poetry, One Kind of Everything: Poem and Person in Contemporary America (Chicago, 2006) and serves as a poetry critic for The New Yorker and The New York Times Book Review. At Wellesley, he teaches poetry workshops and courses on American poetry. The college actually contributed to the genesis of this poet who now graces its faculty. This year marks the 84th annual John Simon Guggenheim Memorial Foundation competition for the United States and Canada. This year the foundation gave 190 fellowships to artists, scientists and scholars with awards totaling $8,200,000. The winners, chosen from more than 2,600 applicants, get an average award of about $43,000. Guggenheim Fellows are appointed on the basis of “stellar achievement and exceptional promise for continued accomplishment,” according to the foundation. In all, 75 disciplines and 81 academic institutions are represented by this year’s Fellows. According to Guggenheim Foundation President Edward Hirsch, since its establishment in 1925 the Foundation has granted more than $265 million in Fellowships to about 16,500 individuals. Scores of Nobel, Pulitzer and other prize winners grace the roll of Fellows, including Ansel Adams, W. H. Auden, Aaron Copland, Martha Graham, Langston Hughes, Henry Kissinger, Vladimir Nabokov, Isamu Noguchi, Linus Pauling, Philip Roth, Paul Samuelson, Wendy Wasserstein, Derek Walcott, James Watson and Eudora Welty. The full list of 2008 Fellows is online at http://www.gf.org.